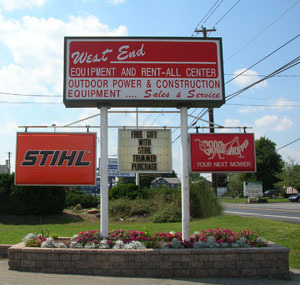 Family owned and operated since 1984, West End Equipment has worked with our customers to establish ourselves as your number one community sales, rental and service center. We are continually adding to our stock of rental equipment based on the needs of our customers and new items being produced. As an authorized dealer of many of the product lines we carry, we take advantage of additional training that is offered so we can be better educated to assist you. Additionally we gain quantity costs savings and access to promotions that we are then able to share with you. Our full-service repair and parts center offers our customers superior service and quick access to parts on not only our equipment, but yours also.